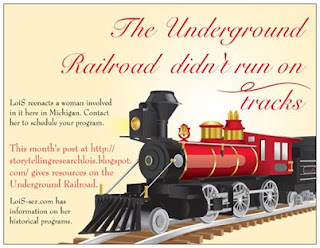 Storytelling + Research = LoiS: Another look at "The Underground Railroad Didn't Run on Tracks (UGRR)"
Another look at "The Underground Railroad Didn't Run on Tracks (UGRR)"
This topic is large and definitely worth reviewing further, this time with a focus on Michigan's role in the Underground Railroad -- often abbreviated UGRR. Michigan split up the former Department of History, Arts and Libraries, with the historical work moved to the Department of Natural Resources. The Historical Center archives the historical materials moved from the former department. Find online from 2000 to 2004 a newspaper, "Michigan Time Traveler", for children with accompanying teacher guides. There are two issues specifically about the UGRR. The Underground Railroad and Teacher's Guide. - This highlights Cass County's Ramptown and the Crosswhite Family rescue by the citizens of Marshall, MI. Here is more about the "Crosswhite Affair" including a lesson plan on it. Similarly both the UGRR and the Crosswhites are covered in this issue for children of "The Mitten", published by "Michigan History" magazine. The Blackburns Escape and Teacher's Guide - Thorton (not Thornton) and Lucie Blackburn escaped slavery to settle in Detroit, but when they were spotted here in Michigan they were captured, tried, and scheduled to return to Kentucky. African Americans helped them escape to Windsor where Canada rejected demands for their return. There's also a section called Freedom Trail Lessons and just as with the two previous Teacher's Guides, there are uses beyond the classroom. In Vandalia, MI they're uncovering proof of Young's Prairie, an early to mid-1800s Quaker offer of farmland and safety to runaways. To learn of the very real incidents of free African Americans being sold into slavery, go to either the 1893, volume 22, of the Michigan Pioneer and Historical Collections or to the online text and search using your own computer's search feature (not the one offered on the site) for Malinda Paris. The memorial of her by the people of St. Clair tells of a family repeatedly sold into slavery even though they were legally free. Early leaders of the Abolition movement here in Michigan were Quakers Laura Smith Haviland, along with friend and neighbor, Elizabeth Margaret Chandler. They were seen as "radical abolitionists" by the majority of Quakers in the late 1830s, so they joined with the northern Methodists who were also devoted to anti-slavery efforts. I've just discovered, after "finishing" this post a wonderful C-Span video of Kimberley Davis-Tranumn talking about "Aunt Laura" and the active role Lenawee County played in the UGRR. Go to C-Span Video Library for her well-researched and inspirational video. Sojourner Truth, who settled in Battle Creek, MI. As noted in my earlier post, that is also the home of the Sojourner Truth Institute as well as this statue honoring her. Much has been written about her including this issue for children of "The Mitten", published by "Michigan History" magazine. Battle Creek was a good spot for her as it was another Michigan location prominent in abolition and the UGRR thanks to Erastus Hussey's political efforts and publishing the abolitionist "Michigan Liberty Press." Tour online a site in Schoolcraft, MI estimated to have sheltered 1,000 to 1,500 by yet more Quakers, Dr. Nathan Thomas and his wife Pamela Brown Thomas. Detroit Historical Museum's "Doorway to Freedom" current exhibit shows sites associated with the UGRR in Detroit including the Finney House barn (in use from 1833) where Liberetta overheard her father and Reverend Charles C. Foote discussing runaways there in danger of discovery. Peter Lerich promptly told his wife he was leaving for a "load of plaster" in Detroit after he found Liberetta listening. In Detroit George DeBaptiste and the Second Baptist Church of Detroit provided sanctuary and transportation to Canada. DeBaptiste also helped organize the 1st Michigan Colored Volunteer Infantry Regiment, later known officially as the 102nd Regiment United States Colored Troops. It's interesting to show the role of disease in the civil war, with 6 killed in action, 5 more of wounds, but 129 died of disease. After the war he returned to successful business life and continued advocacy for black rights including the 15th amendment which gave African Americans the right to vote. It's always hard to bring such a large topic to a close. A fellow librarian once said about me, "You can take the librarian out of the library, but you can't take the library out of the librarian." As a result I want to recommend a book to help you find much more than I have space to mention here. Carol E. Mull's The Underground Railroad in Michigan has been described as "the first comprehensive exploration of abolitionism and the network of escape from slavery in the state." Ms. Mull is a founding member and current chair of the Michigan Freedom Trail Commission. I can't resist this interesting UPDATE. I just read "To my old master" , a fascinating and, yes, funny letter by Jordan Anderson. It responds to a letter by Colonel P.H. Anderson of Big Spring, Tennessee, to his former slave, requesting he come back to work on the colonel's farm. While Jordan Anderson took his family to Dayton, Ohio, and this month's post looks specifically at the Underground Railroad in Michigan, it is a delightful way to look at the later life of many who came from similar backgrounds to benefit from the Underground Railroad and emancipation.